At first glance a Tom N Toms café might be mistaken for a Twilight Zone version of Starbucks: Its logo borders on trademark infringement, a pair of baristas greet everyone with automatic gusto, the pricey lattes come in tall, grande, and venti sizes, and there’s a case full of shiny pastries by the register. You quietly realize that the employees speak Korean, those lattes taste more like sweet potato than espresso, and the pastries on display are plastic reproductions and atypical of coffee shop offerings, like jalapeño-stuffed pretzels. Tom N Toms, it seems, doesn’t mind a little brand confusion as a customer lure, but once you’ve settled into a booth with a green tea TomNccino in hand, it’s clear the franchise isn’t some shameless knockoff. Launched in Seoul’s Apgujeong-dong District in 2001, the company has grown to include more than 400 locations, with 11—and counting—in California. (There are four in K-Town, including the flagship at 3974 Wilshire.) Of the chain’s name, store manager-turned-company spokesperson Alex Kim explains, “We wanted to use a generic name, such as Tom, and then we made it Tom N Toms—basically where a lot of Toms can gather together and hang out.” He says the social emphasis is part of what distinguishes the brand (no headphone-wearing, laptop-tapping freelancers here). 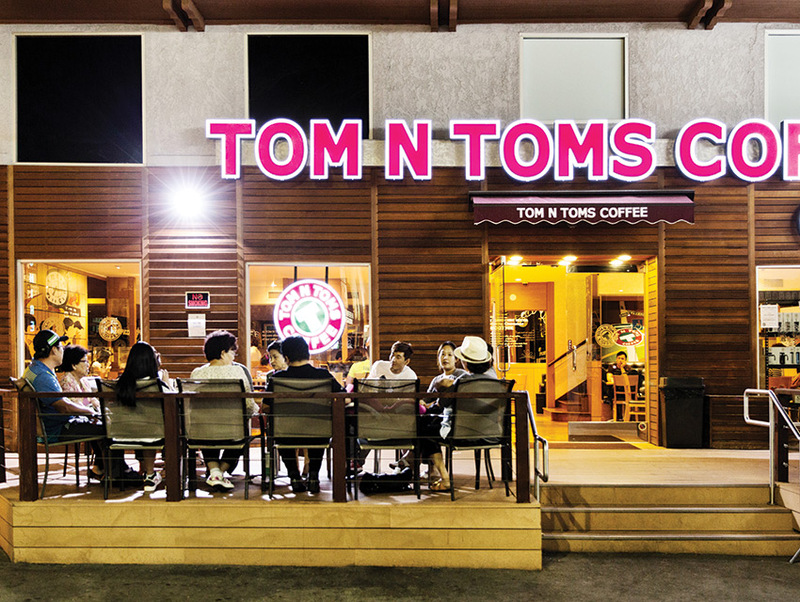 The sweet potato lattes, walnut TomNccinos, and mighty red-bean-and-mochi-topped Bingsuccinos also help Tom N Toms stand out from the usual drip joint. Most of the chain’s shops are open late, some for 24 hours. After a Wiltern show, a black sesame smoothie makes for a novel nightcap. Next articleThe Best Places to Drink Vino in L.A.